Click on the link above to see pics from my adventures with Shaun over the past few days. Shanghai rocked on Wednesday night! It was not because of the crowd, since there were only about a dozen of us. It rocked because I got to hear a great musician play his guitar. 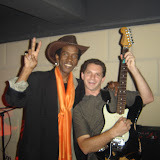 He played soulful blues songs, a few rock songs, and a couple of Hendrix songs for good measure. Jimy Graham and the few who were lucky enough to hear him had a great time. We picked up train tickets to Hangzhou, China's most beautiful city (according to some commercial that keeps playing all the time). We got "standing tickets", since that was all that was available. We did not pick up return tickets. Suggestion: Never let the ticket guy talk you into this. After arriving in Hangzhou, we tried to immediately get a return ticket to Shanghai. What did we find out?...there were none available. So, we said "oh well" and headed into the city, deciding that we would try later and figure out how to get back somehow. Hangzhou was a beautiful place. We walked to the West Lake, the city's primary attraction. We got tickets for a boat tour of the islands located within the lake. It was a nice day, but the crowd was so intense that it really distracted from the entire experience and beauty of the place. These crowds are equivalent to Disney World in FL on a busy weekend. We did hear some great music, saw some beautiful structures, and many other little things that are unique to China. After the tour we wanted to go see one more attraction, but we got on the wrong boat and ended up on the opposite shore than what we expected. When you can not communicate with anyone very well, this stuff happens. We decided to try to get a cab. This was not easy in this town because of the large crowds. We tried at every moment to get a taxi but none were available. We took a break after a while to cool off and have a cup of coffee. I decided I wanted some of the ice cream. I went up and wanted to try a flavor called "yam". I was told it was named after a fruit. However, they would not let me try a bite. I eventually told them that I would not buy any flavor if I did not get to try this one. Still, they insisted that I could not try a bite. At that point I gave in and got a more familiar flavor and enjoyed it thoroughly. In China I was told that the motto is, "you try, you buy". This certainly held true in this shop. Eventually, after a collective hour of trying, we got a cab to the train station. The sign at the ticket booth said, "no tickets to Shanghai." So, we looked for buses and found a line that was incredibly long waiting for buses to Shanghai. Bus after bus came. The line moved quickly and in just over an hour we got on a bus bound for Shanghai. A few hours later we were back in Shanghai! Success! !